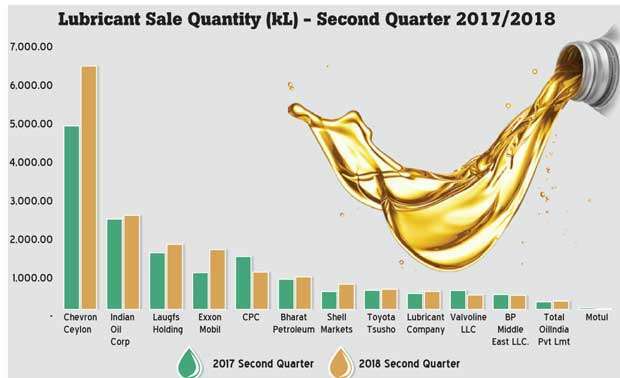 Sri Lanka’s lubricant market leader, Chevron Lubricants Lanka PLC was seen gaining market share lost to its competitors during the second quarter of 2018 (2Q18), the quarterly lubricant market report released by the shadow industry regulator Public Utilities Commission showed. According to the report, Chevron Lubricants’ market share rose to 38.46 percent during 2Q18 from 33.63 percent recorded for the same period last year. However, on a quarter-on-quarter basis, Chevron Lubricants’ market share has come down from 41.88 percent recorded for the first quarter of 2018. The gain in market share was reflected in Chevron Lubricants’ 2Q18 interim financial accounts, as the company witnessed a growth in sales during that quarter, ending a long losing streak in its quarterly revenues. Chevron Lubricants’ closest competitor Indian Oil Corporation Limited, operating through its local subsidiary Lanka IOC PLC saw its market share declining during 2Q18 to 14.88 percent from 16.56 percent a year ago. ExxonMobil, the third largest player in the market increased its share to 9.44 percent from 6.73 percent a year earlier. The State-owned Ceylon Petroleum Corporation (CPC) saw its market share coming down to 5.9 percent from 9.7 percent a year ago. Laugfs Lubricants, a more recent entrant to the crowded lube market, was able to maintain its market share above 10 percent during the 2Q18. Meanwhile, Sri Lanka’s overall lubricant market increased to 16,227. 86 kilo litres during 2Q18 compared to the 13, 995.53 kilo litres sold during the same quarter in 2017. However, the rise in sales could be due to the base effect, as the lubricant sales in the second quarter of the previous year were hit by the floods. Sri Lanka has an estimated 65,000 kilo litre lubricant market. The government that came into power in 2015 has announced its plans to liberalise the country’s lubricant market despite existing market players already calling the market place too crowded. Bids have already been called from interested parties who want to import and sell lubricant.